OBEY, David Ross, a Representative from Wisconsin; born in Okmulgee, Okmulgee County, Okla., October 3, 1938; graduated from Wausau High School, Wausau, Wis., 1956; B.S., University of Wisconsin, Madison, Wis., 1960; M.A., University of Wisconsin, Madison, Wis., 1962; real estate broker; member of the Wisconsin state assembly, 1963-1969; elected as a Democrat to the Ninety-first Congress to fill the vacancy caused by the resignation of United States Representative Melvin R. Laird, and reelected to the twenty succeeding Congresses (April 1, 1969-January 3, 2011); not a candidate for reelection to the One Hundred Twelfth Congress in 2010; chair, Joint Economic Committee (Ninety-ninth Congress); chair, Committee on Appropriations (One Hundred Third, One Hundred Tenth and One Hundred Eleventh Congresses). Papers: ca. 1962-2014, 456 cubic feet.. The papers of David Ross Obey, Democratic congressman who represented Wisconsin's 7th District from 1969 to 2010. 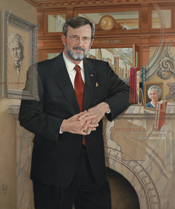 Obey was noted for his leadership in the House Appropriations Committee, particularly its Foreign Operations, and Labor-Health & Social Services and Education subcommittees, as well as his dedication to Wisconsin's Progressive political tradition and his efforts to use government to improve people's lives. The papers concern both national and Wisconsin issues, with many topics such as educational reform, environmentalism, and health care bridging both. Wisconsin topics that are well documented include agriculture and the dairy industry, Native American treaty rights, Hmong refugee resettlement, transportation, and the decline of manufacturing. National topics of note are campaign finance and budget reform, foreign relations and international trade, abortion and religion in politics, and cancer research and occupational health and safety. His papers include speeches and writings, floor remarks, and interviews (some in audio and video form); correspondence; unofficial Appropriations Committee files; press releases, newsletters, clippings, photographs, and other press material; video tapes and sound recordings; district office files; campaign files; and extensive subject files created by members of his staff. A few files document his career as a member of the Wisconsin Assembly (1963-1969). Also included are interviews conducted by Anita Hecht in 2014 and produced by the Wisconsin Institute for Public Policy and Service in which Obey shares his memories and insights on his nearly 50 years of public service. Part of the collection is also at the Wisconsin Historical Society. Sound Disc: ca. 1999, 1 sound disc. Faith, family & friends [sound recording] / Dave Obey and the Capitol Offenses. Oral History: In the Morris K. Udall Oral History Collection, 1996-ongoing, 4 linear feet. Interviewees include David Obey. Film Reels and Videocassettes: 1970-1988, 4 commercials on 3 film reels and 7 commercials on 3 videocassettes. The commercials were used during David Obey's campaigns for the 1970, 1976, 1978, 1984, and 1988 U.S. congressional elections in District 7, Wisconsin, Democratic Party. Papers: In the Bill Moyers Papers, 1971-2010, approximately 185 feet. Interviewees include David Obey. Papers: 1984-1990, 0.1 cubic foot. The papers of David Ross Obey contain a press packet prepared by his office concerning his role and that of the rest of the Wisconsin Congressional delegation in the Indian treaty rights issue. Also included is a summary of events, beginning with the court's decision to uphold treaty rights, newsletters, press releases, correspondence (outgoing only), and proposed legislation. Obey, David R. Raising Hell for Justice: The Washington Battles of a Heartland Progressive. Madison: University of Wisconsin Press, 2007. Obey, David R., and Paul Sarbanes, eds. The Changing American Economy: Papers From the Fortieth Anniversary Symposium of the Joint Economic Committee of the United States Congress. New York: Basil Blackwell, Inc., 1986. Ralph Nader Congress Project. Citizens Look at Congress: David R. Obey, Democratic Representative from Wisconsin. Washington, D. C.: Grossman Publishers, 1972.